The New Scientist magazine on December 4 shared on the FB page (I could not locate an "official" source) a very amusing cartoon by illustrator Tom Gauld titled "The three little scientists and the big bad wolf", riffing on the classic "The three little pigs" fable. 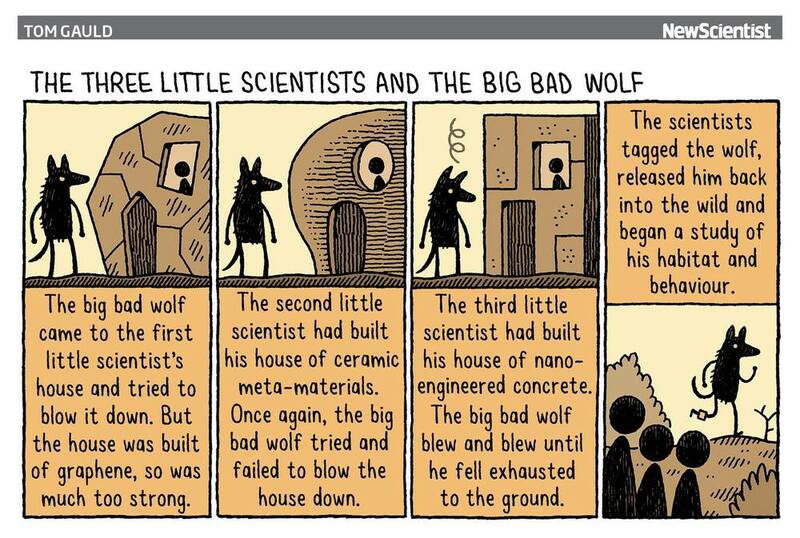 What I want to do in this post – apart from sharing the ingenious cartoon – is to explain a bit the materials the three little scientists used to build their houses and why they might indeed frustrate the big bad wolf. The mentioned materials are graphene, ceramic meta-materials, and nano-engineered concrete, and I'll tackle each one in turn below. [If a] 1 m2 hammock [made of graphene were] tied between two trees you could place a weight of approximately 4 kg before it would break. It should thus be possible to make an almost invisible hammock out of graphene that could hold a cat without breaking. The hammock would weigh less than one mg, corresponding to the weight of one of the cat’s whiskers. Easy to see why the wolf would be frustrated by such a house. See also the video below for a nice quick introduction to the material. Short film by the European Graphene-Flagship initiative, introducing graphene, the 'wonder substance' set to revolutionise the electronics industry. Next, let's turn our attention to ceramic meta-materials. I actually wasn't aware people were doing meta-materials out of ceramics! In general, by metamaterials it is meant that a material is structured on a size scale smaller than the wavelength of a certain phenomenon, typically electromagnetic radiation. The field has gotten a lot of attention in recent years, chiefly because it enables material properties that are simply impossible to realize in normal materials. This enables, in principle if not yet fully in practice, such fanciful things as invisibility cloaks and perfect lenses. Greer's team has developed a method for constructing new structural materials by taking advantage of the unusual properties that solids can have at the nanometer scale, where features are measured in billionths of meters. [The] Caltech researchers explain how they used the method to produce a ceramic (e.g., a piece of chalk or a brick) that contains about 99.9 percent air yet is incredibly strong, and that can recover its original shape after being smashed by more than 50 percent. The third material is nano-engineered concrete. I couldn't find a lot of information on this, but the basic idea is clear from the terms: concrete is one the most widely used building materials on Earth, known already to the Romans (although that knowledge was lost for centuries after the Fall of the Roman Empire). A house made of normal concrete would be strong enough, but nanoengineering – the controlled modification of a material's properties on the nanometer scale – could conceivably make it even sturdier, and frustratingly wolf-proof. One group of engineers at MIT decided to focus its work on the nanostructure of concrete, the world's most widely used material. The production of cement, the primary component of concrete, accounts for 5 to 10 percent of the world's total carbon dioxide emissions; the process is an important contributor to global warming. [T]he team reports that the source of concrete's strength and durability lies in the organization of its nanoparticles. The discovery could one day lead to a major reduction in carbon dioxide emissions during manufacturing. The final panel turns the story on its head and brings home the fact that these were three little scientists, and not piggies: they tag the wolf and release him to the wild to study him. Tagging in this context means that a transmitter that minimally disturbs the animal's normal behavior is attached to it (seen as the ankle bracelet in the cartoon), and tracked remotely usually either by radiofrequency telemetry or GPS. This way the movements, and sometimes when a video recorder is included, even the habits of the animals can be conveniently studied. See below for an awesome example of the point of view of a polar bear by US Geological Survey. This video was edited and compiled from raw footage recorded by a camera equipped radio collar that was put on a female polar bear in the Beaufort Sea during April 2014 by the US Geological Survey. This new type of camera technology was developed by videographer Adam Ravetch with the support of the World Wildlife Fund. Took me an hour or two to unpack all this, but hopefully you found it amusing and/or informative!